CSL Asia Shipping Pte Ltd. has been operating since 1994 and manages CSL’s business in Asia and Africa, as well as CSL’s global transhipment operations. CSL Asia operates and manages high-capacity transhipment platforms in Kalimantan, Indonesia. With transhipment rates in excess of 2,000 tonnes per hour, our transhippers allow our customers to overcome draft restrictions and load both Panamax and Capesize vessels. 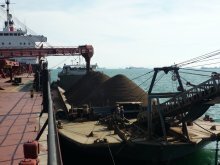 Along with providing customised transhipment services, CSL Asia also delivers dry bulk shipping solutions with self-unloading bulk carriers. These vessels are focused on shorter trade routes where the fast discharge rates of self-unloaders have a significant impact on cycle time, and where the inherent lower dust emissions from self-unloaders are important for importers. CSL Asia focuses mainly on projects in South East Asia, but we also work in Africa and China.